Perfect for serving your signature pizza or famous funnel cakes, this 9" white uncoated paper plate is an essential item for your business to serve customers quickly. Plus, it gives you the no-frills option you need for service at the price your budget wants. You can easily even pop it in the microwave to rewarm fresh muffins or other goods. These are alright paper plates at an alright price. They are quite and thin. This works in there favor for weighing items as they don't add much, but I have found liquids can soak through. What a great value. We go through paper plates like there is no tomorrow. I will definitely be ordering these again. Hopefully it won't be tomorrow, lol. Your standard unwaxed paper plate. Good for sandwiches and other light food where you don't want to waste a heavier plate. For anything else, be prepared to double these up as they're very thin. These are your basic paper plates with no frills. They will bend if loaded too heavily, or if you use wet foods on them, but double them up and problem solved! These are very economical. Awesome, cost effective plate. We use these for pizza slices, to go orders etc and have not had one complaint. Sturdy for the money . Would def recommend. These paper plates are fine for very lightweight & dry items only. These paper plates are very thin/flimsy, so if you put something a little heavier than potato chips, you'll need a sturdy plate or basket below it. But for the inexepensive price, it's fine and what you should expect. I love these and use with another regular plate, Then when we are done throw then away in a trash container. They are very durable and the cost for 100 is priceless to us. They stack fantastic in our paper plate holder that goes under our cabinet, We priced these at other stores and their was more expensive. To us WEBSTRAUNT always has the best prices for every item you purchase. Its on the thin side but these are cheap and perfect for family events especially if you have a lot of those. Good for dry food. These are very thin, but what I expected based on the price point and type of plate. These work well for snacks and light foods, definitely not anything heavy or juicy. We like that these plates come in wrapped portions and they are priced competitively to what we were buying from a local vendor. Definitely a product we will continue buying. These paper plates are great for a light snack, but I would not recommend using them for a heavy dinner as they are a bit flimsy. Other than that it’s always nice to wash less dishes! These are great everyday basic plates. We keep them on hand in my house to avoid running the dishwasher daily. Sometimes you have to double up for heavier foods but for the price it’s still a deal. basic white paper plate. nothing fancy.. not the greatest quality, but for the price, they are just fine. you definitely cant pack these full of food and expect them not to bend.. they are good for snacks or arts and crafts! the price is right! If you are looking for a low priced paper plate this is a good choice. This paper plate is 9 inches in diameter. We would recommend using two plates at one time because they are not the most sturdy and durable plates. However, if you are looking for a good price and you operate maybe a food truck this is a good option. I will most definitely buy these plates again! They are a great value for the price that you pay; even if you need to use more than one for greasy food...still a good deal!! I bought these plates becuse our church was going to have a big picnic so this was perfect for all the nacho chips, corn, etc. The 9 inch paper plate is a perfect size for lunch or dinner. They are string enough to handle a few slices of greasy pizza with out leaking through. The one hundred pack of nine inch white economy paper plates has met all of my expectations. I was pleasantly surprised at their flexibility, and that they do not feel flimsy at all even with heavier foods like ice cream cakes and chicken legs. I would definitely order them again and hope for additional sizes in the future. These white paper plates are great for a BBQ. I would be careful of how much food you put on them because they aren't super heavy duty. These paper plates are not as sturdy or heavy duty as some of the others, but it definitely gets the job done for all of the lighter jobs. These plates are great. They are an amazing price and pretty durable for a paper plate. I use these all of the time for my kids cooking classes. I highly recommend them. This are very flimsy plates but you really can't complain when they are so cheap. They are fine when you double them up. They tend to soak up liquid when left to sit for too long. This type of plate is not very durable but as long as you know that, you will not be disappointed with this brand. This type of plate i great for light uses, no great for wet foods or heavy knife use as the plates will tear. PERFECT size, not too small, and not too gargantuan, I like these ones a lot and they hold up well with weights an grease. I would recommend. I purchased these plates for a party. They are of great value and quality, they are strong enough for food, cake, pizza, etc. I will purchase them again in the future. 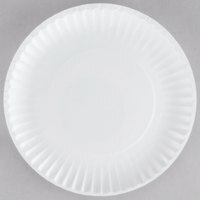 These economical plates are a nice choice for fast food, take out pizza or home use. Not very sturdy or soak proof but decent quality for a cheap plate. These plates are Economical , Yet, Functional! Love the classical textured Rim! We highly recommend for fast food serving! Got it from here, Webstaurant Store! 4 Stars! Great plates for the price but often times you have to double up so the food grease doesn't completely soak through. Good for things like pizza. these plates are durable and are of great quality, priced right, much more cheaper than sams club or costco. we go through a lot of plates in our company. these plates are good for what they are. very cheap paper plate, very flimsy. you' have to be careful if you're putting anything heavy on. also grease will soak through. These plates are a classic! We use them for everything around the house. I use them for crafts, paint paletts, and of course to eat off. These paper plates get the job done when you're not wanting to wash dishes and looking for an easy solution for dinnerware! I like the larger 9" size compared to the 6" option since it can be used for breakfast, lunch, dinner, and snacks. An around great paper plate. For the price and the quantity it really is an economy plate. We use these plates at our hotel all the time. Bought these for a party, they are nice and strong for cake, pie or pizza slice. You get a lot of them, I also use them for crafts or art projects with the kids. Good deal will buy again. Great value. Have a good thickness and can hold all different foods with no issue. Not going to leak easily. Don't need to waste money by doubling up. We use these plates when there is a bloc party or an event and we just want to leave as quickly as possible with little to no clean up. You can use the 9" White Economy Paper Plate 100 / Pack plate to eat tortilla chips. You can easily serve the chips with cheese. Happy with the purchase. These plates are very sturdy and can hold a great deal of food. These were the perfect size for a standard lunch or dinner and they held up very well. The plates are absorbent, but with runnier foods (runny spaghetti, thicker soups) then it will start to bleed through. I knew this before buying, so I am not knocking it as they are good plates, I just wished it wasn't so hard to get them apart! I generally end up using 2-3 at one time. Great buy. The surface has almost a glossy sheen so food does not stick as much compared to the paper plates without the glossy sheen. These plates are very thin, and really did not accomplish what we needed from them. We were trying to be more environmentally conscious, but we needed to use 2 to 3 of these plates compared to 1 regular plate. Thanks for your review! These are quality paper plates offered at a great price but if you are looking for a disposable environmentally friendly plate that is thicker then you should check out the Green Wave TW-POO-010 9" Biodegradable Plate 125/PK. It is made out of all-natural products and is completely biodegradable. Great price for standard white paper plates. They work well one by one, and if you need more strength, just double them up. They're affordable enough that you can use two. Great price for these paper plates. They are just as good as the ones you get from the store for a rock bottom price. If you need heavy duty ones you may have to look for a better quality variety though. Webstaurant.com has a better price for these plates than any vendor we've found. If you are looking for a no-frills paper plate, these can't be beat! we use these plates for our funnel cake fundraisers. They are good quality, and hold up well. 1/2 the price of what you find in the grocery stores. Buy them here and save! Great product for quick parties and in home usage. Have the family over and there is no washing dishes. One time use. Great for cakes and much more. super great price! I priced similar plates at a discount club store, and could only get one half the amount for this price! Will be ordering again real soon!